The oasis of Alviano is, with the one in Colfiorito, one of the two natural zones in umbria where fauna e flora are protected. The lake was realised by the ENEL with a barrier, and was officially classified as a naturalistic oasis on 1990 and entrusted to the management of WWF Italy. Today the Oasis is more than 9 square Km wide, and the very shallowwater, always between 20 and 30 cm, favoured the colonization by birds species very rare in the center of italy. Being a humid and swampy area the flora is mainly given by cane fields. Among the water birds colonizing the oasis it should be reminded: red herons, cormorants, tarabusis and minor tarabusis, water hens, and others. Ash heronsi, major hite herons, royal malards, stay in the part of the lake where the water is less deep. During migrations the rare species of the fishing hawk and the italian knight, remain and rest in peace here. 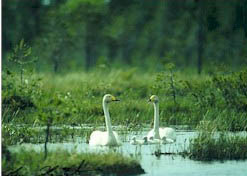 Recently even a couple of Royal Swans nested here (see the picture). Among the mammiferous, the presence of the coypu has been growing during the last few years.